This composite map shows where most people drew Bed-Stuy's borders on DNAinfo New York's interactive, which asked readers to outline their neighborhoods. BEDFORD-STUYVESANT — When it comes to Bed-Stuy’s borders, most locals can agree on one thing — Broadway’s a dividing line for the area. We asked readers to map where their neighborhood begins and ends, and the results are in — albeit with some serious geographic disagreements. As a new wave of residents moves into a changing Bed-Stuy, there’s some contention over neighborhood territory. Most say Myrtle Avenue, Bedford Avenue, Fulton Street and Broadway form its borders, while a few go as far as Washington Avenue on the west and Prospect Place as the southern divider. 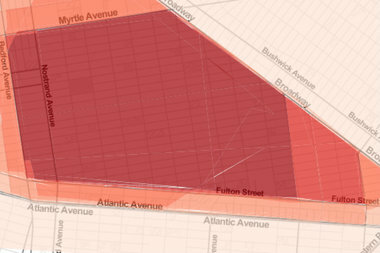 For those who reported having lived in Bed-Stuy for less than five years, the western and eastern cutoffs are Bedford and Saratoga avenues. The majority of longtime residents who said they’ve been in the area for more than 20 years cite a smaller neighborhood, with the eastern boundary drawn just short of Malcolm X Boulevard.